In this library I’m talking about RFID (Radio-Frequency IDentification). Radio-frequency identification (RFID) is the wireless non-contact use of radio-frequency electromagnetic fields to transfer data, for the purposes of automatically identifying and tracking tags attached to objects. The tags contain electronically stored information. Some tags are powered by and read at short ranges (a few meters) via magnetic fields (electromagnetic induction). Others use a local power source such as a battery, or else have no battery but collect energy from the interrogating EM field, and then act as a passive transponder to emit microwaves or UHFradio waves (i.e., electromagnetic radiation at high frequencies). Battery powered tags may operate at hundreds of meters. Unlike a barcode, the tag does not necessarily need to be within line of sight of the reader, and may be embedded in the tracked object. 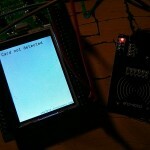 source: wikipedia.com For that I used Mifare RC522 RFID reader from NXP. I got it on Ebay almost for free with 2 RFID cards included. This chip works with RFID on 13.56MHz. To get this to work, you also need RFID cards with same working frequency (included in packet from ebay). 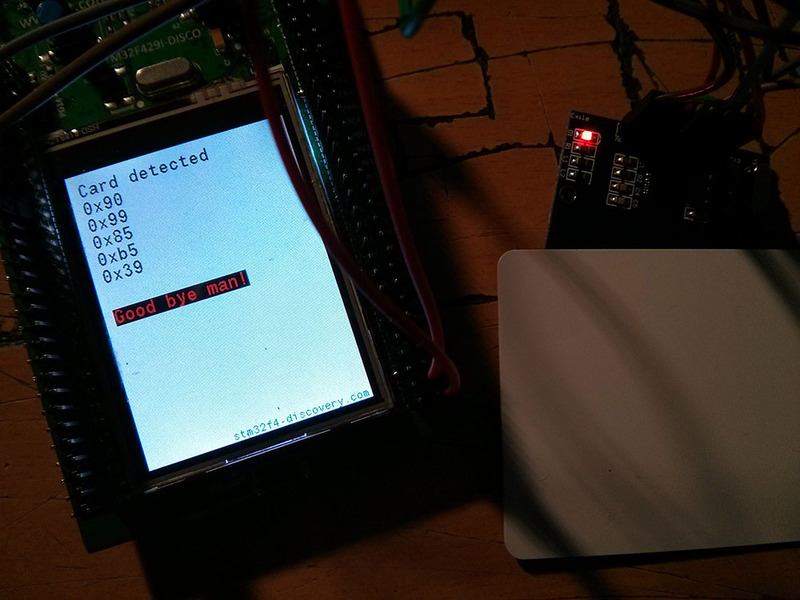 I got this working on STM32F429 Discovery board with SPI communication and display data on LCD on board. Detection distance was about 10cm from receiver. 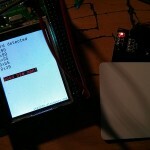 My RFID uses SPI. This chip has also support for UART or I2C communication. And also, my RFID board has CS (chip select) pin marked as SDA (I2C Serial Data) so don’t worry if you don’t have CS pin on your board. 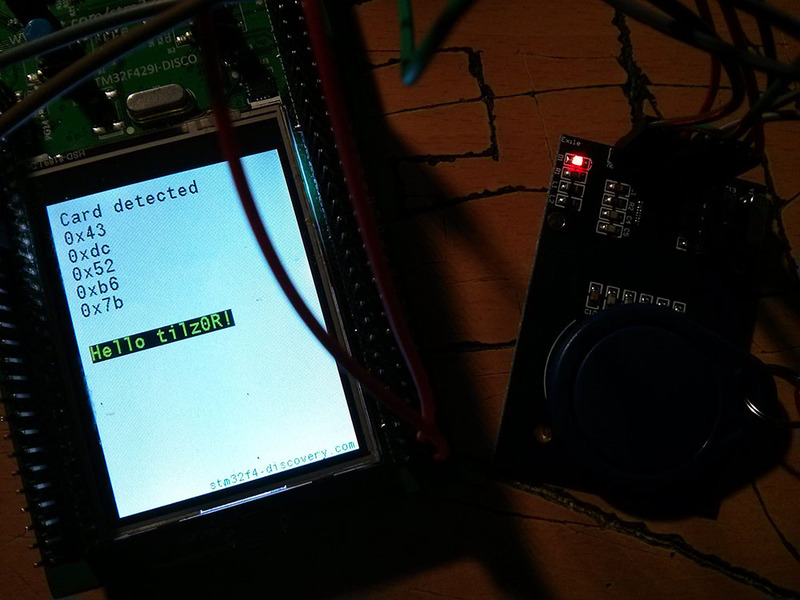 * Pointer to 5bytes long memory to store valid card id in. I also made a compare function, which is reeealy simple function to compare 2 5 bytes long arrays if they are equal. Useful when you have to compare your ID number with card number to detect if you “have access” to eg. open door. In this example I check for my RFID card (blue). 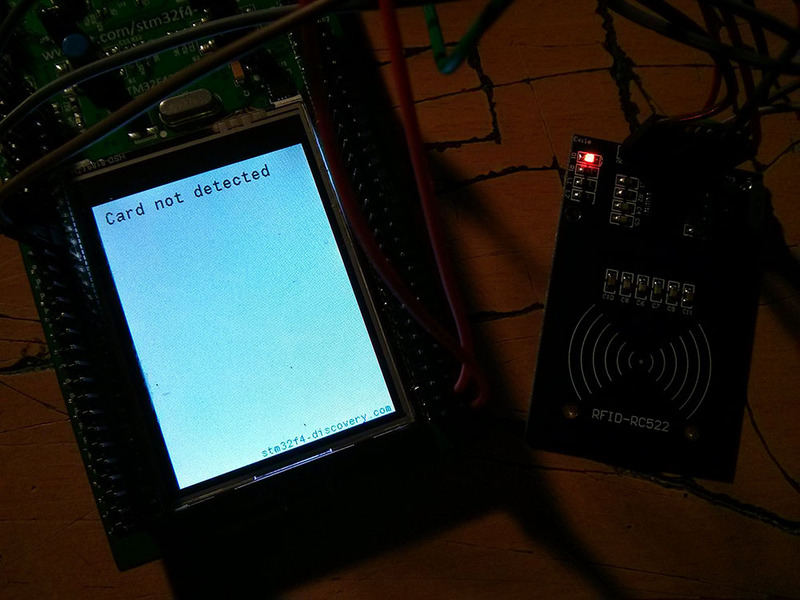 RFID reads card id and if they are equal, it simply write data to LCD.